Director – Simon Wincer, Screenplay – Everett de Roche, Additional Dialogue – Jon George & Neill Hicks, Producer – Antony I. Ginnane, Photography – Gary Hansen, Music – Brian May, Special Effects – Conrad C. Rothmann, Production Design – Bernard Hides, Magic Consultant – Willie Kay. Production Company – Hemdale. The enigmatic magician Gregory Wolfe appears at a party for Alex, the son of Australian senator Nick Rast. Befriending Alex, Wolfe appears to cause a complete remission in Alex’s haemophilia. As Wolfe starts to exert an increasingly charismatic influence over Alex and Rast’s wife, Rast’s political backers become nervous and plot to dispose of him. A fascinating film from the heyday of the so-called era of Ozploitation from Simon Wincer and screenwriter Everett de Roche who would both go on to become mainstays of the Australian film industry (see below). It is not long in before one realises that Harlequin is a retelling of the story of the so-called Mad Monk Grigori Rasputin, the faith healer and mystic who held a darkly charismatic influence over the throne of Russia under Tsar Nicholas II just prior to the Russian Revolution. Rasputin was reputed to have healed Nicholas’s son Alexei of haemophilia and of having had an affair with the Tsarina before he was assassinated by the nobility, resentful of his influence over the Royal Family. Harlequin even acknowledges the source of the Rasputin story to the extent of keeping the names of the key players – Tsar Nicholas/Nicholas Rast (Rast being an anagram of Tsar), Alexei/Alex, Tsarina Alexandra/Sandra, Grigori Rasputin/Gregory Wolfe. One of the points that screenwriter Everett de Roche tries to make in his script is that Rasputin is not an outright villain – certainly, Wolfe is portrayed with a great deal more benevolence than history (or at least cinema) sees Rasputin as having. 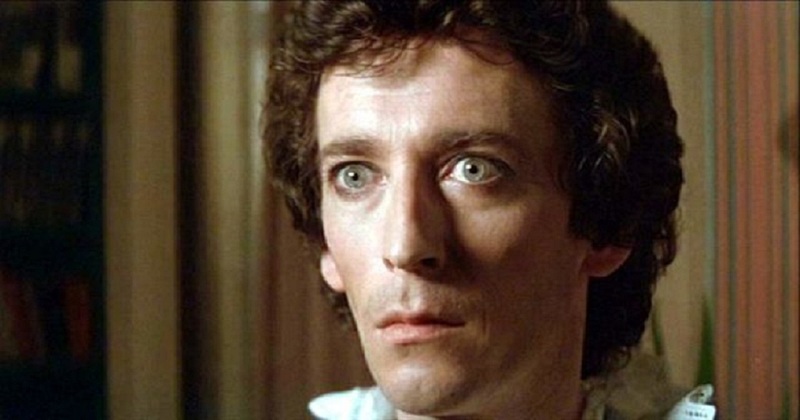 De Roche tries to portray the character in terms of the suasive influence he had on the people around him – in this respect, the aloof coldness of Robert Powell’s usual acting it put to fine use. Powell is outfitted in a sensational array of costumery – including black leather, harlequin costumes and the striking incongruity of a dinner suit with black nail polish. The film is full of startling illusions and tricks – in the end, one is kept deliberately uncertain whether Wolfe’s powers are real or not. The end rises to a startling level of metaphoric analogies between magicians and politics and between assassinations and vanishing tricks. A film that makes one think. Australian director Simon Wincer who went onto make mainstream films such as Free Willy (1993) and Crocodile Dundee in Los Angeles (2001). Wincer’s other genre films include the stalker film Snapshot/The Day After Halloween (1979), the android boy film D.A.R.Y.L. (1985), the Cyberpunk biker film Harley Davidson and the Marlboro Man (1991) and the comic-book superhero adaptation The Phantom (1996). Harlequin still remains Simon Wincer’s best film. Everett De Roche has written a number of other Australian genre films including the excellent Nature’s Revenge film Long Weekend (1978), Patrick (1978) about a psychic coma patient, the stalker psycho-thriller Snapshot/The Day After Halloween (1979), the psycho-thriller Roadgames (1981), the killer boar film Razorback (1984), the killer chimp film Link (1986), the Aboriginal children’s fantasy Frog Dreaming/The Quest (1986), the psycho-thriller Heart of Midnight (1988), the ghost story Visitors (2003), the Backwoods Brutality film Storm Warning (2007), the remake of Long Weekend (2008) and Nine Miles Down (2009) about a mineshaft that drills down to Hell.